Learn how to buy the best AC for your needs. Summer is the time for swimming, vacations, and racking up huge electric bills, if your old air conditioner is not energy efficient. Upgrading to a new unit, whether a central system or window unit, will help cut your bill while keeping you comfortable. The key to shopping for a new air conditioner is knowing about energy ratings and what the mean for your budget and the environment. According to Energystar.gov, the Energy Star program is a voluntary program where companies and individuals can work together to make and buy products with a mind to their environmental impact. Established by EPA in 1992, under the authority of the Clean Air Act, the Energy Star logo is a familiar sticker on many appliances, particularly air conditioning units. EER stands for Energy Efficiency Rating, and the standard government rating is 9.8. Many of the newer units have a EER of 110.8 or 11. These ratings apply to central air conditioning units as well as window and portable air conditioners. The best part is that purchasing an energy star unit can save you money at tax time too. As of this writing, federal tax deductions exist for purchasing energy saving appliances. Central Air conditioners are quiet and take up less space than window and portable units. They also are more effective in keeping your house cool and comfortable. Unless you live in a tiny apartment, having central AC is the best practical way to cool your home. As it is a big-ticket expense, many homeowners delay putting out money for new unit; however, the money spent on a new central air conditioner unit will save money in the long run, so it is a wise investment. Many of these units are designed to blow out of the central heating pump. What some purchasers don’t understand is that unless the blower exhaust systems in the heating unit is updated, the new system will not work as well as designed. If you live in an apartment, or simply cannot afford central air conditioners, window units are the way to go. They also have energy star ratings. You need to keep the size of your window and the area you are cooling in mind to choose the best one. BTU’s stand for One British Thermal Unit (BTU) and stands for the amount of heat needed to raise the temperature of one pound of water by one degree Fahrenheit. The Energy Star website has a handy guide to how many BTUs are needed to cool a certain sized room. For example, an 8,000 BTU Window unit would be adequate to cool a home office, but a larger unit would be needed for the living room. Many homeowners who don’t opt for central air find that they can save energy and money by installing several smaller units around the home, and turning off the units in rooms that are not in use. A central air conditioning unit cannot be calibrated to only cool one room unless there is a separate thermostat unit in each room. 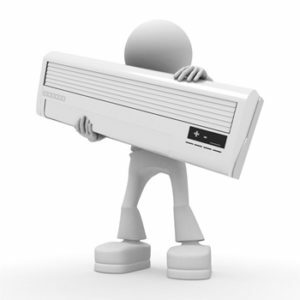 Portable floor rolling types of air conditioners do not work as well as central air conditioners, or even window units, but can be handy to roll out in an emergency if your central unit breaks down. A hose is attached out of the window for air exchange. Looking for the Energy Star sticker and getting a unit, whether central or portable, to find an air conditioner that matches your home’s space, budget and cooling needs. Whether you are using air conditioning two months out of the year in Wisconsin or nine months a year in Florida, keep the environment as well as your pocketbook in mind to get the best deal.